When FNB stole, lied in high court and committed fraud, I asked for help....no help was given. Thousands of home owners have lost their properties the same way I did due to dishonest investors, sheriffs and bank employees. By using one investor as an example I can now prove how FNB attorneys assisted in fraud and corruption. This site is dedicated to stopping the corrupt practice of the banking sector, bullying people who have fallen on hard times, leading financial ruin and loss of the roof over their heads. On the 15th of April 2014 I was offered the opportunity to increase the value of my ownership by upgrading to a bigger unit. With the bigger unit I would receive a higher exchange value and the exchange would offer me 4169 points for the 2-bedroomed unit. The levy would increase by R53.00 per month. I signed an accepted the offer. In 2015 I had to fight for my points (4169). Now in 2016 I am told that they made a mistake and that my point's value is only 2100. 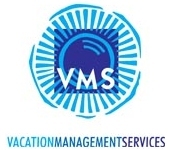 Stay away from Vacation Management Services (VMS), their promises are not worth the paper they are written on. I, Nico Niemand, state herby that the contents hereof are true and correct to the best of my knowledge, and fall within my personal knowledge except where indicated otherwise. Why are you lying to the SAPS, case number 145/3/2016, regarding the theft of my weapon? You were the only person who knew where it was, and you removed it. I call that theft. My father was diagnosed with dementia and you were appointed by the court to be his curator. I phoned you on the 20th of July 2014 and asked you if my father's will is safe. You answered "Yes Nico, now that I am appointed as curator no person can change your dads will" But you lied and still went and changed it. Amelia, you had full control of my father's funds. You bought R700 000 worth of African Bank shares for the Niemand Family Trust. When African Bank was delisted the trust lost almost 50% of the value of the investment. When I asked you why so many African Bank shares were purchased, you told me that it is no concern of mine because it is not my money. The Niemand Family Trust was created for my handicapped brother Paul. That is his money, and I do care when it concerns him. After my father's death Amelia Morgenrood paid more than R155 000 into his personal account. Is this legal to do so without permission? The funds were subsequently withdrawn by family members. Today they cannot present proof of where the money went. My father registered a trust for my handicapped brother in 2003. Amelia Morgenrood recommended that Jaco Tereblance be a trustee. When my father passed away in August 2015 we have had to ask numerous times for a copy of the deed, to this date nothing has been received. When doing further investigation we discovered that the trust has never been audited and no banking account has been opened. The trust had a sizeable share portfolio and Mr Tereblanche earned a commission from this, but in all these years never performed his required duties with regards to the trust. Is this ethical? Eight months have passed since my father's passing and we are still awaiting the audited documents. 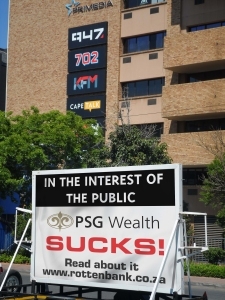 When appointing trustees for your trust - Stay away from PSG Wealth! Emails have been sent to Jan Mouton, Kobie Kritzinger and Barry Swanevelder, all PSG Wealth employees, asking for help - no response to date. The employee behind the vendetta against me, she never changed the address to where I reside when she was asked to do so. I asked him for help on four separate occasions, and as CEO, he never responded to my cries for help. I asked him for help twice and he never responded. I asked him for help with no response. After a criminal act took place at a meeting on the 22nd august 2013 at his offices, I requested a copy of the recording made and not the transcript. I am still waiting for the recording. 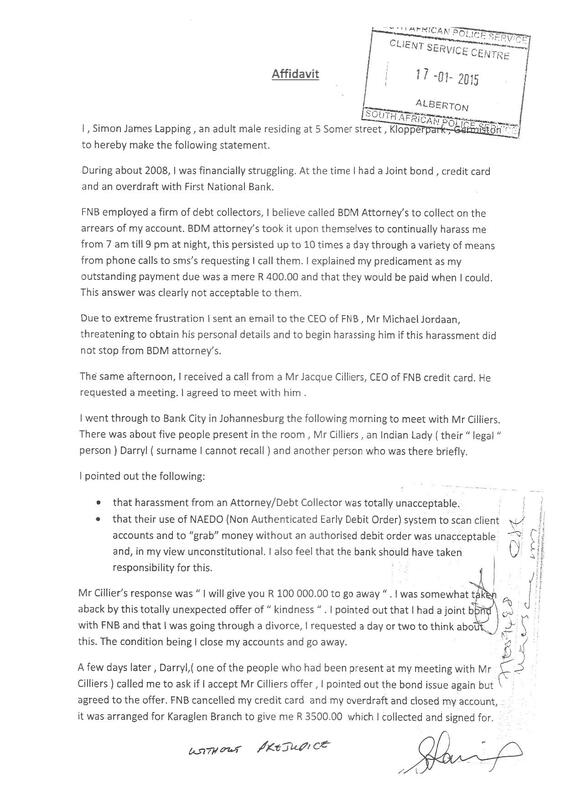 Is the CEO of FNB, Jacques Cilliers, guilty of fraud? My tenant phoned me on the morning of the 25th of August 2010 and asked me why people are looking at the property in 8 Coronation street, Triomf. I smelled a rat and immediately phoned T Rapoo (FNB) and asked him what the story is about 8 Coronation. He told me that the property was going on auction on the 26th the next day. I asked him what I should pay in to the property. He gave me an amount of R5600.00. Embarrassed I had to borrow this money to save my property. Please take note that the R5600.00 was for R2000.00 arrears on the bond account and R3600 for legal costs. After paying 14 years on this bond, the bank wanted to take my property! Also take note, I was never informed, no correspondence at all to notify me about the sale! The next morning (26th August), I phoned T Rapoo and asked him what was happening at 24 Minnaar Street? He informed me that the arrears amount was R8200.00. This tie the legal fees was R3600.00. Actual arrears were only R4600.00 after paying this account for 17 years. Rappoo could have told me the previous day about this when we discussed 8 Coronation. This is typical of how the bank treated me and wanted to make sure I lose money. Again no notification from anyone, from the Sheriff, other correspondence or emails from bank employees, no correspondence at all! If you look at the comments from Wendy Zulu when Carte Blanche asked her about the sale on 24 Minnaar, she lied to Carte Blanche and told them this auction was cancelled a few weeks prior to the 26th. 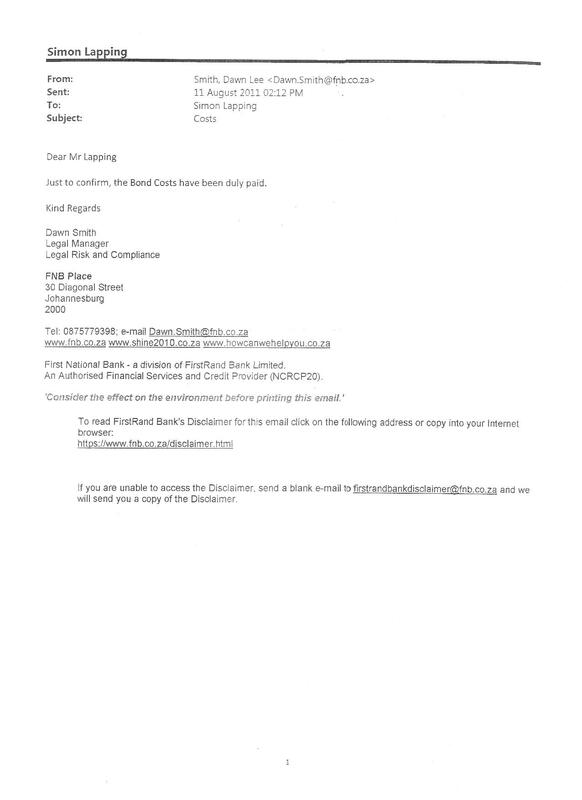 Wendy Zulu also claimed in her report to Carte Blanche that the bank phoned me several times with regards on the above to notify me of the auction, but Marianne van der Berg of Hullsteyn attorneys had access to FNB system and confirmed that only one call in the month was made to me (which I did not answer). Caller ID (pr 1999). 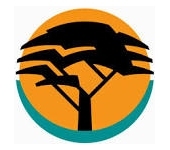 I went to Clearwater branch in Roodepoort and one of the FNB employees phoned Tshepo Rapoo and informed him not to go ahead with the auction because I deposited cash into the accounts. The proofs of payment were faxed to him and the auctions were cancelled. I realised that if I didn't save y properties that day I would have to fight again in the High Court and it would have cost me a R100 000.00 in legal fees on each property.... ....Who has money to throw away like this? The way FNB tried to steal my houses and try and auction properties left, right and centre, the public should know about this! 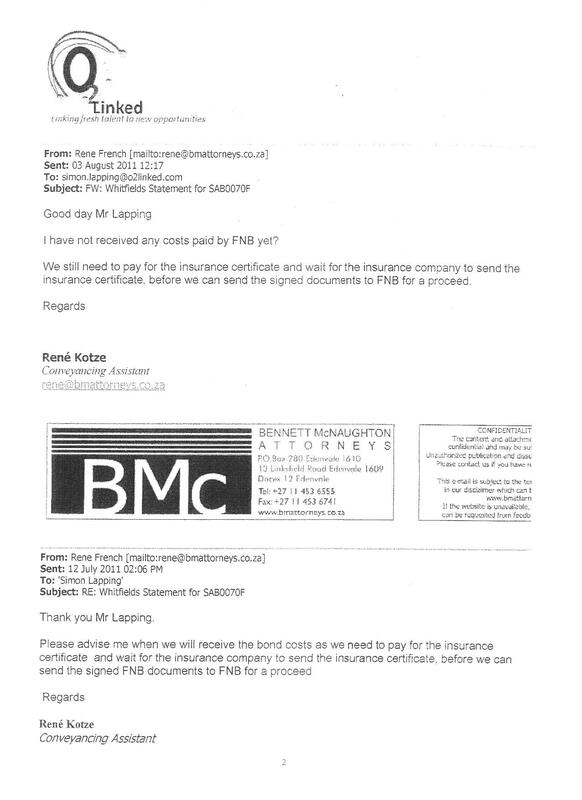 After the court case on 110 Barnes Street in October 2010 we agreed that I will pay the costs of the Advocate and that this Advocate from FNB will send his invoice to Steyn & Steyn Attorneys so that I can make the necessary payments. He never did so and decided that he will without my knowledge deduct the money directly from my bond account. He literally stole this money from my account. Then after a year on the 26th of August 2011 I received a Court order (Warrant of execution) that I should still pay that amount R22 800.00 otherwise they will execute my movable goods from my house in South Crest. Again just to show that FNB wanted to make my life a living hell. 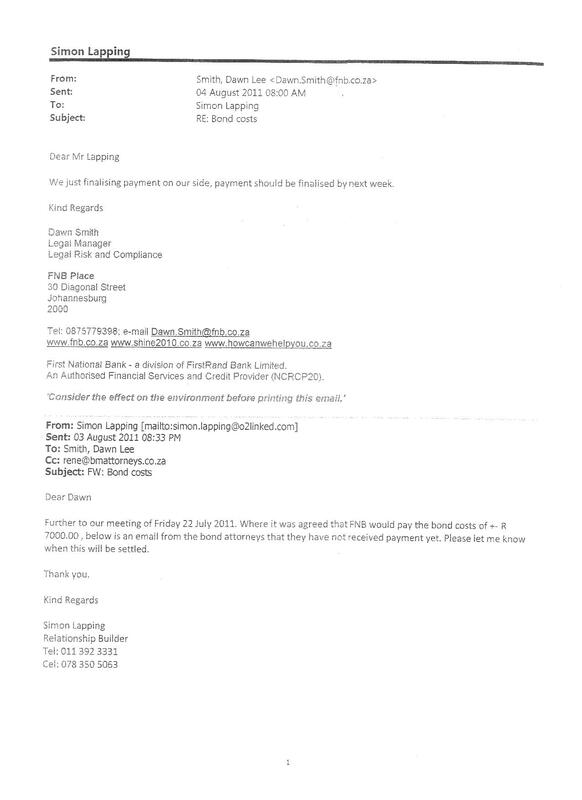 Wendy Zulu (Head of Legal FNB Homeloans) lied to Amalia Christoforou (Carte Blanche) in an email sent to her on the 3rd of February 2012 with regards to the auction of 120 Collins street. Brixton. These lies cost me millions of rand. 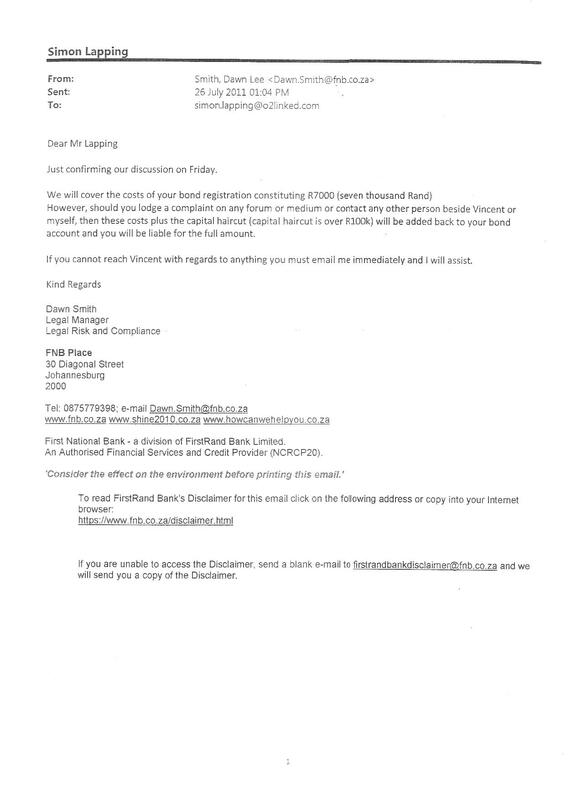 Thank you Carte Blanche for forwarding these FNB lies to me on the 1st of March 2012 at 10:10:51. Now it makes sense to me that this is nothing but a personal vendetta which First National Bank started in 2009. I sold my property (120 Collins Ave, Brixton) 1st December 2009. Upon request from FNB to cancel an auction scheduled for 10th December, Attorneys Dykes van Heerden faxed all documentation to FNB. Same was accepted and a Mr Rapoo cancelled the auction. On 10th December, 15 minutes before the sale, FNB called me to inform me the auction was indeed continuing. I offered R48000 cash to cancel the auction, but this was rejected. The property was sold and I lost R550000 from my own personal sale. Subsequently, the new owner took occupation. He was unable to deliver full purchase price, however FNB allowed him to stay on for 2 years, rent free! Said owner cleverly rented the house out to students and collected R240000 worth of rentals in 2 years, which he personally pocketed. He also illegally reconnected council electricity and ran up a bill of R100000. FNB then applied to have the sale cancelled, through Attorneys Van Hullsteys. I contacted Mariaan van der Berg, of said attorneys, with regard to progress of the cancellation of the sale, and was promised that I would be the first one contacted when cancellation went through, to enable me to sell the property (again), and due to my losses. Said attorneys never contacted me in this regard. Fast forward to 24/11/2011 - I received an SMS from FNB stating that same property (120 Collins Street) was going on auction, and gave me a whole 45 seconds to pay arrears, failing which the auction would proceed! (This, after the attorneys had reassured me they would contact me first). The property was (once again) sold on auction. To the same buyer who had previously bought it, couldn't provide full purchase price, and never paid!! This is not a summary of just bad service received; this is an honest and accurate version of me being on the receiving end of what I can only assume as a personal vendetta against me by First National Bank Financial institution. "How Can We Help you?" Not in my case. 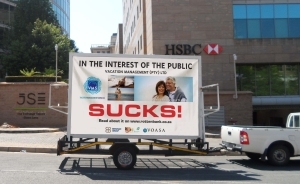 Not the FNB Care Hotline, not the CEO of Home Loans, Jan Kleynhans and not the CEO of FNB, Michael Jordaan at any time during my nightmare dealings with FNB, lived up to the 'so-called' promise relayed to the public in all their advertising campaigns. I own various properties in the Johannesburg area, bonded by FNB and which are all rented out. One very specific property in Brixton and FNB's dealings with me with regards to this property has been the cause of my now deteriorating health, financial insecurity and total loss of trust in this financial institution. I have discovered that within their inner circles, if you as the client should hit on any irregularities and inconsistencies, they will pull together as a team, cover for each other to make sure their versions are in alignment with each other and you really have almost no chance to break through their wall of defence. Due to an arbitration case that lasted 18 months and a legal bill of R110 000 that I had to pay, my property, 120 Collins Street, Brixton went into arrears, I made an arrangement with the bank and sold the property on the 1st December days before the auction date. This sale agreement was sent to Mr Tsepo Rapoo (FNB) by my attorneys Dykes Van Heeden and Mr Rapoo indicated that he wanted proof that the purchase price was available. Such proof was provided by my attorneys and Mr Rapoo informed me that the sale in execution, scheduled for 10th December 2009, will be cancelled. On the 10th December 2009, 15 minutes before the sale was due to be held, I received a phone call from a Mr Lawrence Mabuza(FNB) stating that they are proceeding with the sale unless the full balance is paid into the conveyances' trust account. I was completely caught off guard as this was contrary to a specific agreement reached between myself and Mr Rapoo. My property was sold on auction on the 10th December 2009 for an amount of R272 000. 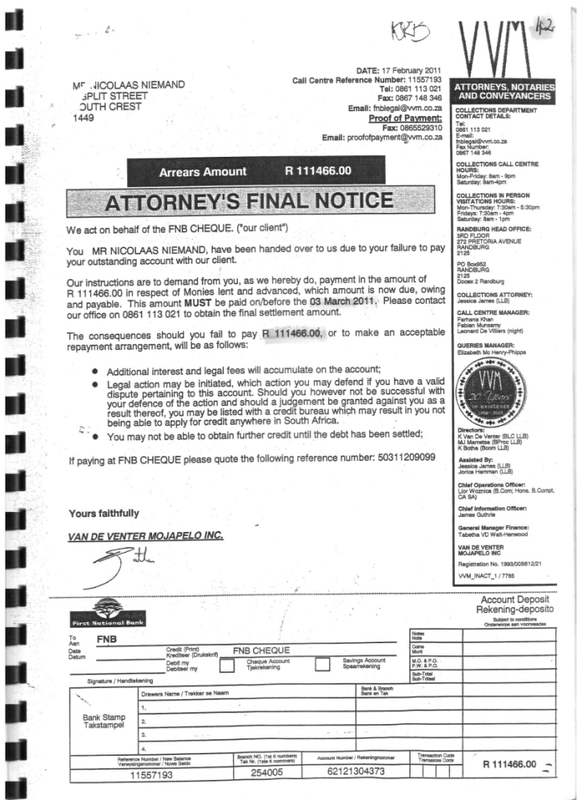 This whilst I had an offer of R735 000 and the purchaser had provided proof to FNB of the availability of his funds. This caused me severe financial stress. I had bargained on the approximately R500 000 that I would receive from the proceeds to sort out my life and make sure all my other bond payments on the other properties are up to date. During the early part of 2010 I was advised by Mr Rapoo that the purchaser of the property has not come up with the guarantees and therefore FNB is of the intention to cancel the sale. Mr Rapoo's words to me: "Mr Niemand, the bank treated you unfairly." After losing more than R500 000 from the sale, life began to be very hard and financially draining on me. Yet the bank did not stop their vendetta against me. They tried to sell two of my properties that were only R2000 in arrears. Thanks to my tenants who took the initiative to phone me and warn me a day before the auction was to be held, I was able to make immediate payments and thereby saving my investments. FNB also tried to sell one of my properties in the Albertville area, even though this property wasn't even in arrears. A lady from the Government Gazette phoned me to warn me of the planned auction. When I spoke to the bank, their answer was: "Sorry, it was a mistake." In one instance a matter with one of my properties ended up in the Pretoria High Court where the judge was extremely critical of FNB's attitude and approach in regards to this matter. He indicated from the bench that he is highly unsatisfied that FNB would not accept my settlement proposal and seems to be hell bent on ensuring that I lose my property. FNB eventually agreed to settle this matter out of court. Today I am in a position where all my bond payments are up to date and through sheer hardship and the help of my family, I have managed to save all my properties. But I am extremely angry with the bank and its employees, for the loss of money and the thousands I had to spend on legal costs, just because they simply could not care. I was treated not just unfairly, but I was treated like a criminal and I want people out there to know that their promises are empty, and it takes very little for them to turn on you like vultures, not giving a damn about what their actions may do to you and your families. What more must I do!!! 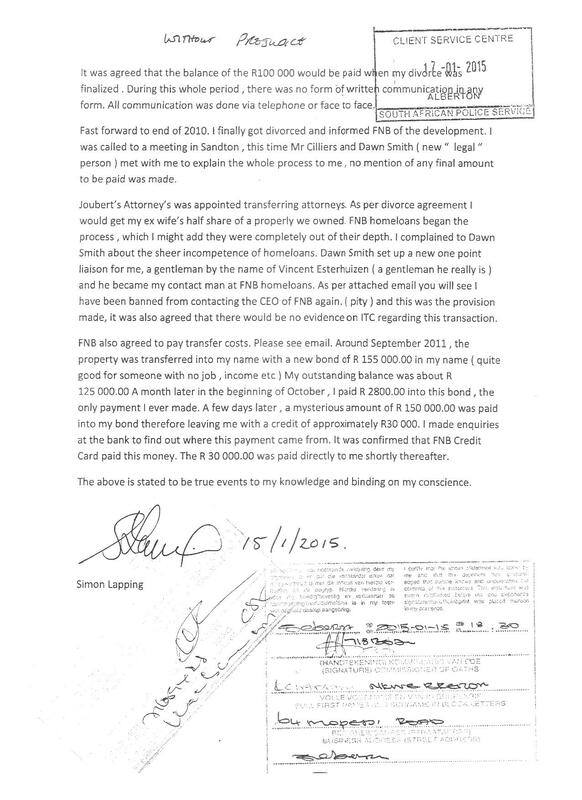 18th January 2011:Michael Jordaan receives second document with NO RESPONSE. February 2011: Michael Jordaan receives 3rd document from my branch manager in Fordsburg, still NO RESPONSE. 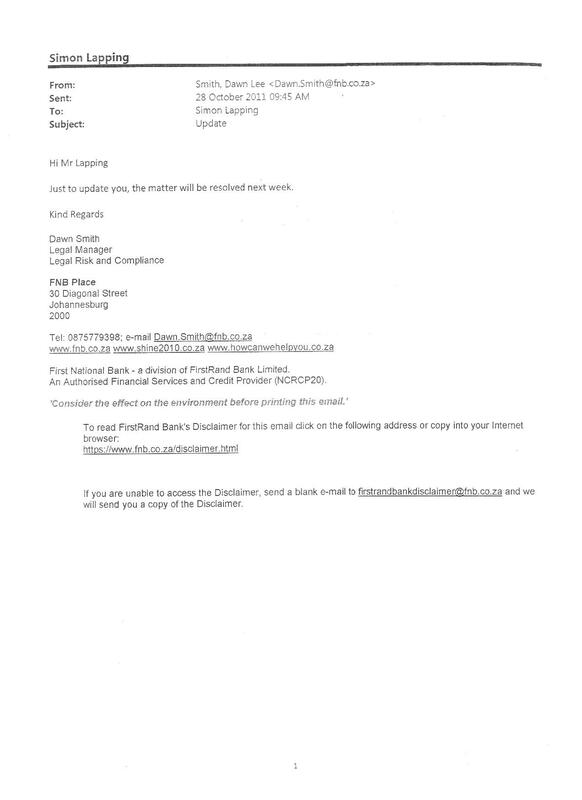 29th August 2011: Sharon Pereira accepted 4th document on behalf of FNB @ Bank City - NO RESPONSE. 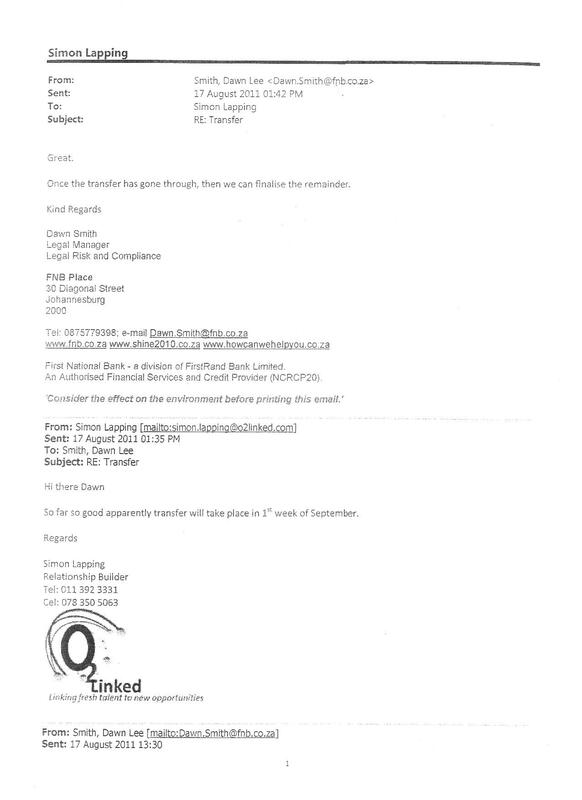 29th August 2011: Same document gets mailed to CARE FNB (Customer care), CEO Johan Burger, CEO Ben van der Ross, CEO Firstrand Sizwe Nxasana, Laurie Dippenaar, Paul Harris, Viv Bartlett and Jan Kleynhans. Sizwe Nxasana replied that he will look into the matter - nothing happened. From the others - NO RESPONSE. 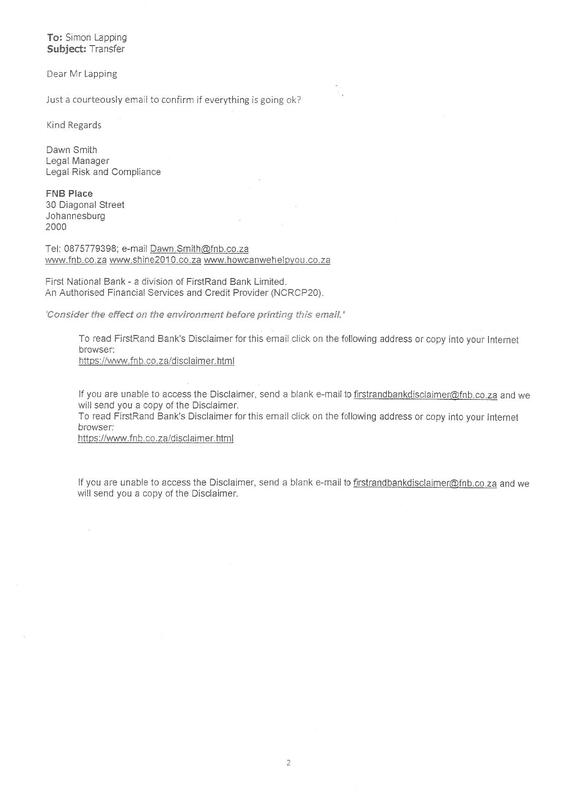 30th August 2011: Sarah Sokoch accepted document on behalf of FNB CARE @ FNB at their Randburg Offices - NO RESPONSE. Why did the bank continue with 120 Collins Street Brixton auction after relevant documentation was delivered by Dykes van Heerden Attorneys??? Purchaser proved that he had R3.2 million in his account, we only needed R735 000 for the sale. Why did FNB try and sell 8 Coronation Street Triomf and 24 Minnaar Street Albertville without notifying me. The arrears were only R2000, this after I had been paying these bonds for 17 years. On the 26th August 2011, the Sheriff sent by FNB, directed the High Court of Pretoria to attach and take into execution the movable goods on my property in South Crest, Alberton. 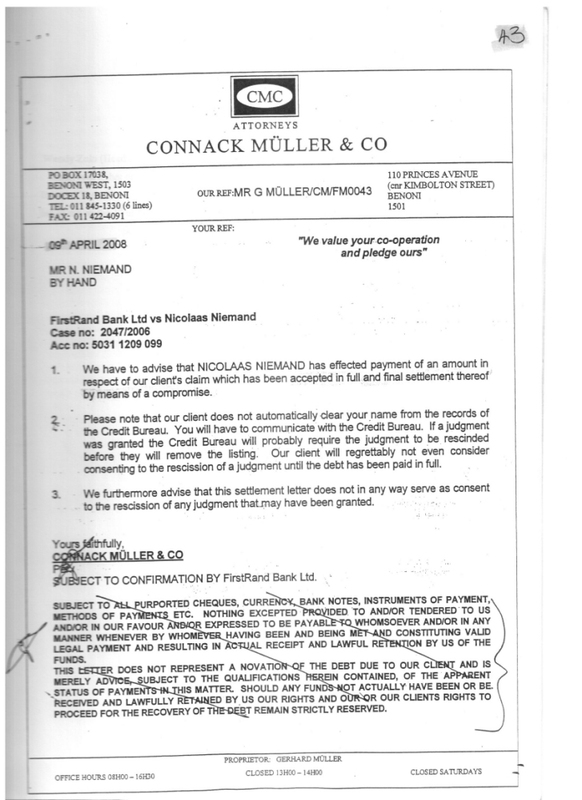 Firstrand was again in the wrong; the bank was paid on the 8th October 2010!